Now more than ever, homeowners are looking at their bathrooms as an increasingly important part of their home decoration. 2016 is shaping up to be a great year for bathroom decor ideas with several hot, new trends hitting the marketplace. You can now integrate your bathroom into your home decor and create intimate, luxurious spaces that cleanse the body and refresh the spirit. 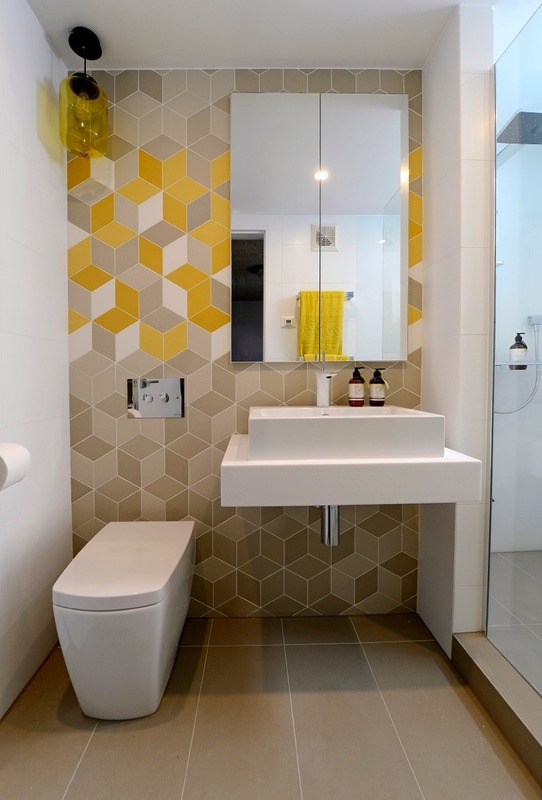 These bathrooms combine form with function to create a 21st century living space that has an aesthetically pleasing design and modern conveniences. 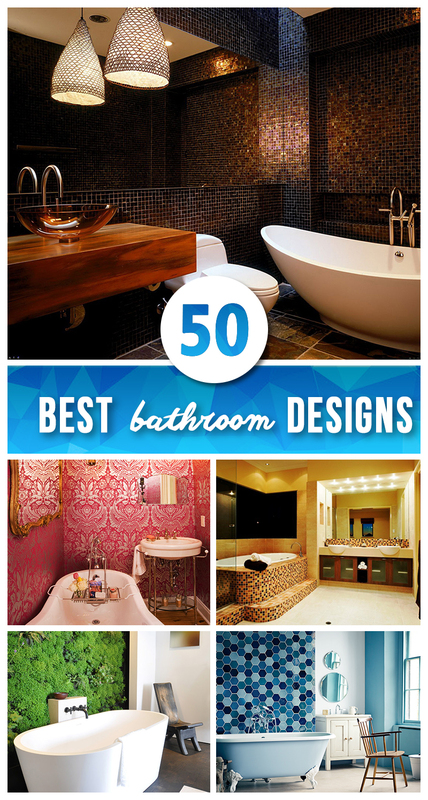 So with that in mind, here’s 50 bathroom design ideas that will inspire you. These bathroom decor ideas range from the quirky to the glamorous. Bathrooms aren’t just for convenience anymore. They are deeply personal living spaces where you can soak in nature, spend time with your significant other or even relax with a glass of wine and a good book. There’s something in these bathroom designs for everyone whether you’re planning a minor makeover or creating a whole new living space. If you have a tiny apartment, we’ve got ideas for adding a tile design or a fresh coat of paint to jazz up your living spaces. Perhaps, you have an outdated second bathroom that has a severe case of seventies style. We’ll show you how to modernize with a sleek industrial design or turn the space into a bright and inviting children’s bathroom. If you’re looking for the latest bathroom decorating ideas for a luxurious master bath, we’ve got plenty of tips from bathroom decor inspired by ancient Roman spas to zen-like spaces that incorporate nature into a design that beckons you to rejuvenate your spirit. So with that in mind, Happy Designing! 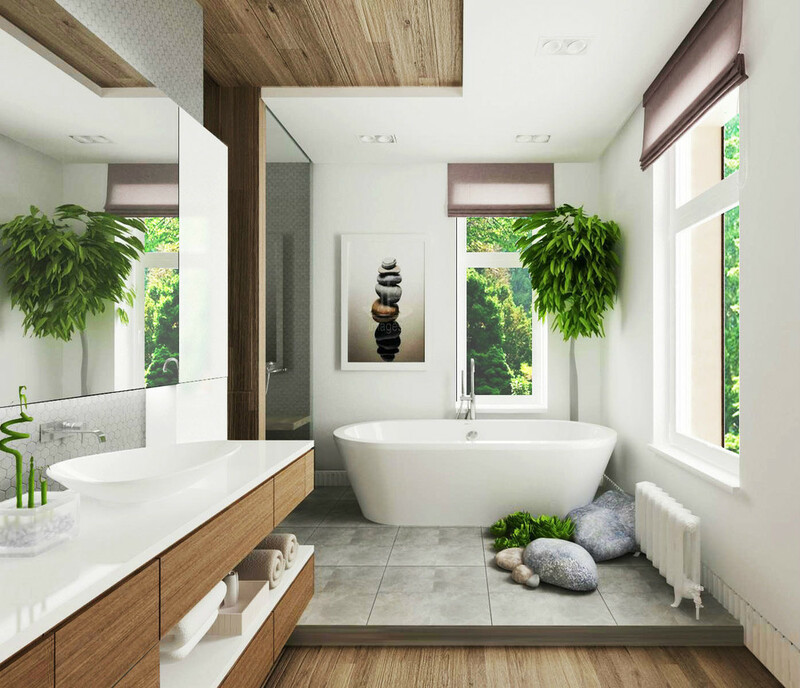 This sleek modern bathroom combines form and function into a relaxing living space that is in tune with nature. The large windows, rocks, and ferns bring a sense of the tranquility to the bathroom that is heightened by the natural wood floors and cabinets. The clean simple lines of the porcelain tub and sink add to the zen-like feel, as does the excellent use of space. The expertly designed cabinets provide plenty of storage while the large vanity can accommodate more than one person. 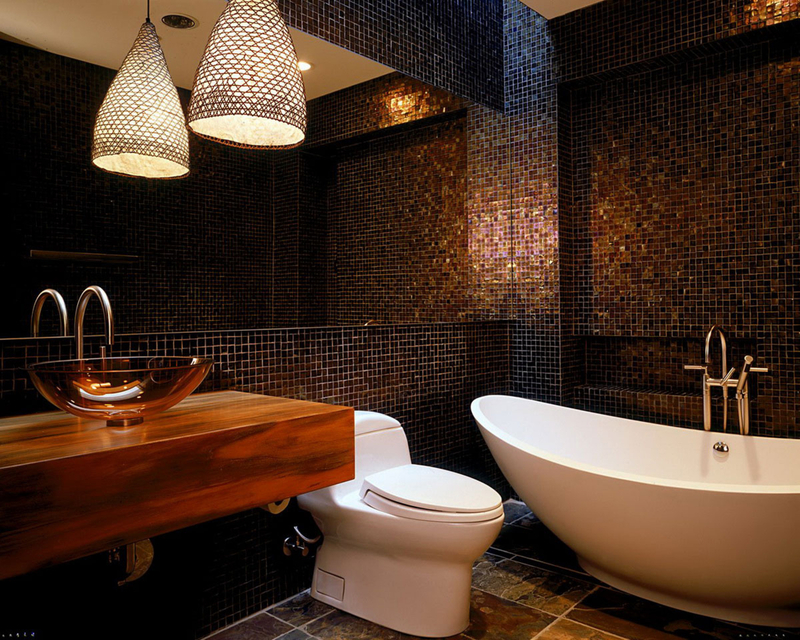 A luxurious bathroom is possible, even if you have limited living space. 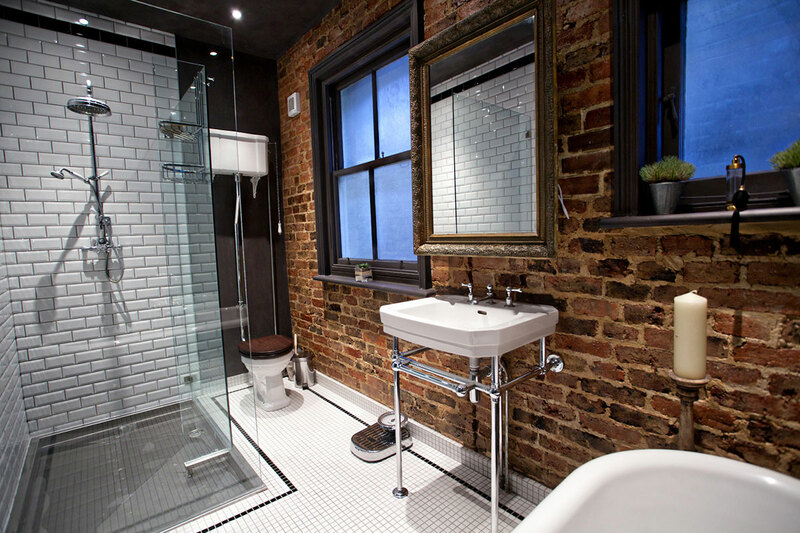 This highly functional bathroom artfully combines everything you need into one small area. The long design of the stand-alone shower gives you plenty of room, and the artfully placed tub fits perfectly without taking up any leg room. Also, the sleek fixtures provide ample storage for necessary items. This design with its rich color scheme of bronze and gold also makes the space seem larger and gives it an unmistakable old-world glamour. 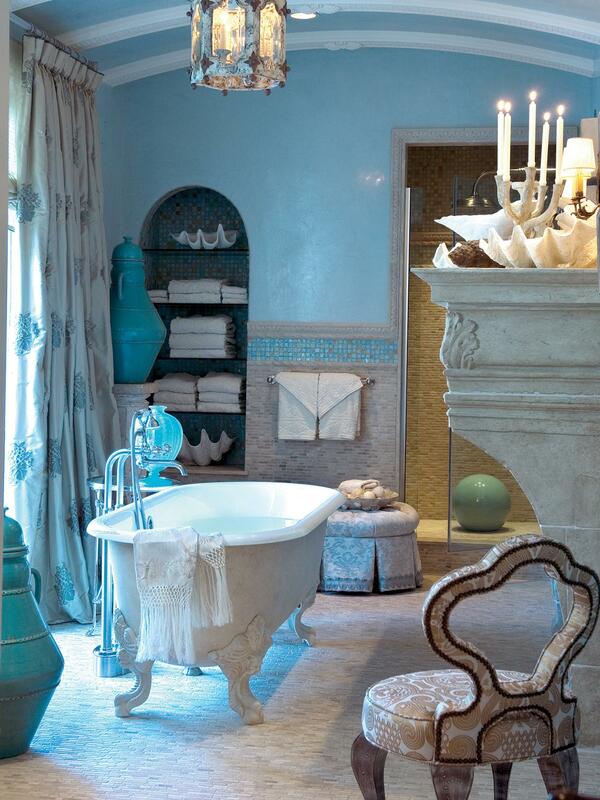 If you’re lucky enough to have a home with an ocean view, this is a bright and elegant bathroom design. The pastel blue wall color will enhance the ocean view while the aquamarine accessories and green and coral tile are the perfect color complements for beach side home decor. The Victorian-inspired claw-foot tub invites you to soak and enjoy a good book while the stand-alone shower features all of the modern amenities. This bathroom is also a luxurious living space. You can pull up a chintz chair by the fireplace and enjoy a glass of wine and a glorious sunset. This fun and funky design is perfect for a second bathroom makeover, especially if you have a young girl in your life. 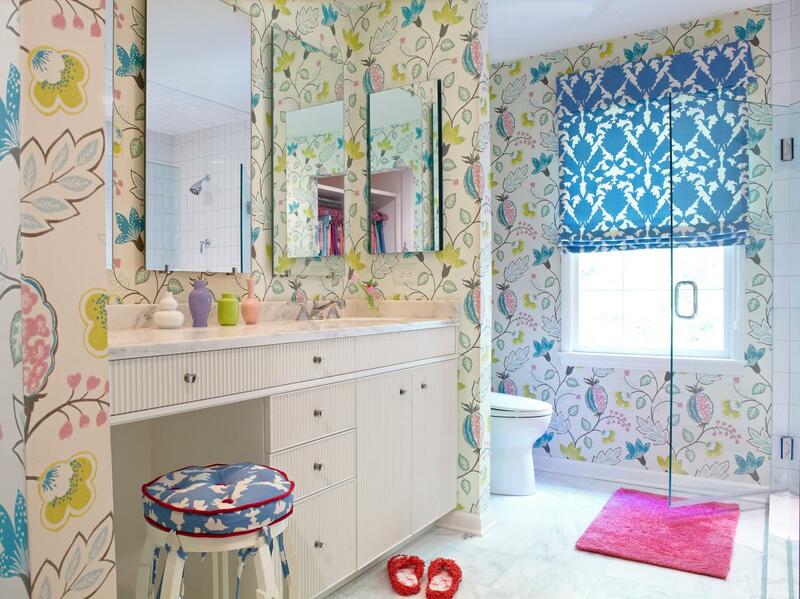 The bright wallpaper is a great way to appeal to your teenager’s love of color while at the same time covering up the dated and dark bathroom designs that are all too common in older homes. The nifty vanity gives everyone plenty of room to complete their morning hygiene routine. Plus, she and her girlfriends can pull up a stool after school to experiment with makeup and beauty tips. The clean white cabinets and three mirrors also help to lighten up the dark space. 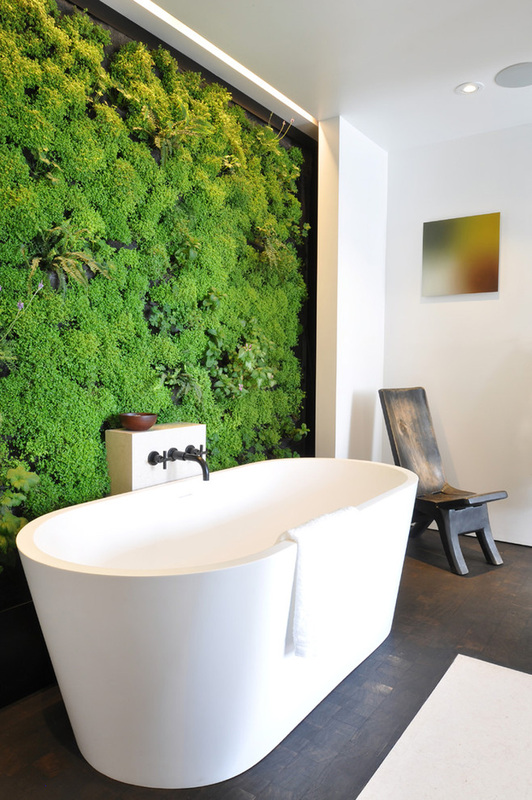 These bathroom decor ideas are ideal for both lovers of nature and avid DIYers. Outdoors types won’t be able to resist this carpet of grass, flowers, and ferns, which bring a fresh and relaxing feel to the bathroom. The outdoor carpet covers a great deal of space, so it’s also ideal for remodelers who need to cover up an entryway or something unsightly in an older home. Whatever your reason, the outdoor carpet is the centerpiece of this design. The stark white walls and utilitarian design of the tub and chair complement the riot of green that is the centerpiece of the room. Not everyone is a fan of chintz furniture and pastel wallpaper, so with that in mind here’s some bathroom decorating ideas for the rugged individualist. 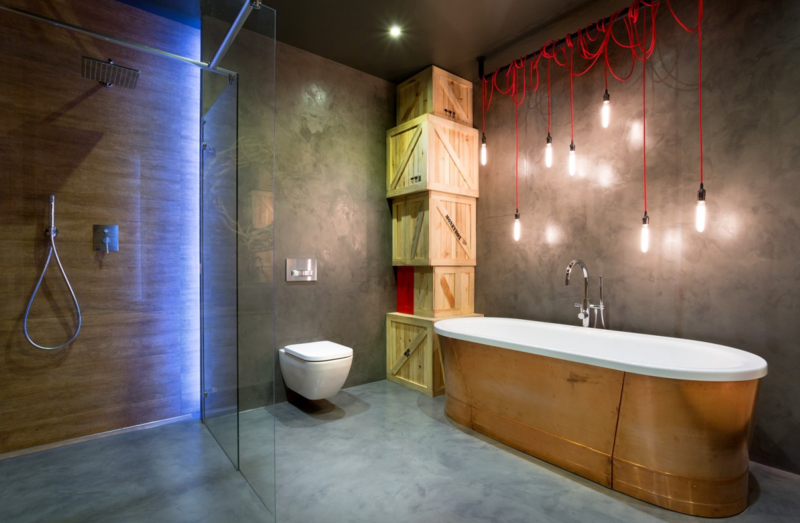 This bathroom combines a utilitarian style with a bit of whimsy, using wooden boxes for storage and electric bulbs hanging from extension cords for lighting. The concrete floors and grey marbled walls also enhance the construction zone feel of the room without going over the top. Despite the rough edges, this is a fully functioning, state-of-the-art bathroom with an elegant shower and tub. If you just have a small space to remodel, you probably want bathroom ideas that won’t break the bank. This guest bathroom has been completely redone with just a coat of paint, new fixtures and some new flooring. The intricate blue and white tile brings the whole room together. 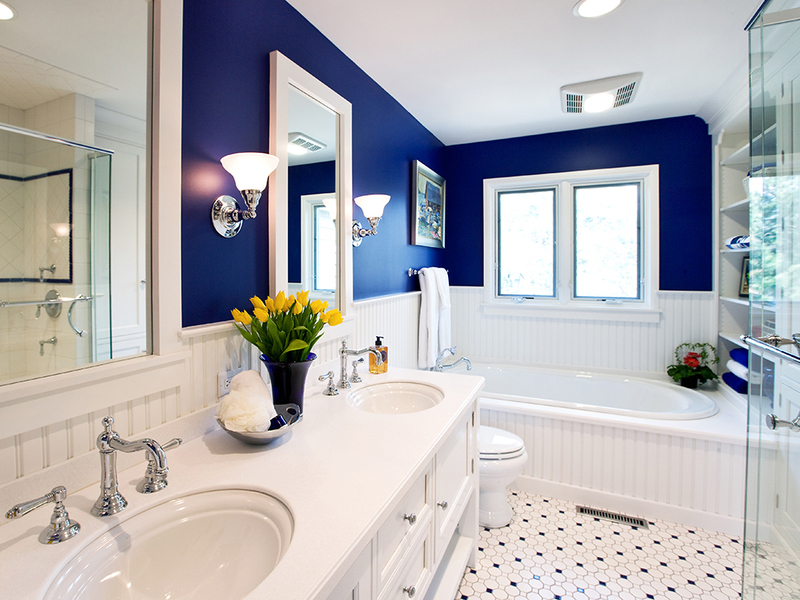 The deep blue wall color adds a touch of elegance to the room while the white cabinets bring light to a dark space. The elegant silver fixtures and the fresh flowers makes this a room you and your guests will want to return to again and again. This eye-popping bathroom decor is for the fashionista who has everything. The fifties-inspired design has a serpentine vanity where you can primp in style, and there’s plenty of storage space for your Manolo Blahniks and designer bag collection. The funky fixtures and the swirling wallpaper enchance the retro-feel, while the clean white tile floors brightens up the interior. This bathroom has plenty of cabinet space for your cosmetics and beauty care items while the recessed lights will add extra light when applying cosmetic and beauty treatments. Apartment dwellers have unique challenges when it comes to bathroom design. This simple, yet chic design lets you maximize your style even when you have a minimum amount of leg room. The square shape of both the sink and toilet is modern and stylish without taking an extra space. The Cubist inspired tile design is a great way to add a bold pop of color to an otherwise muted palette. Plus, if you don’t like yellow, you can choose tiles in a rainbow of colors. The medicine cabinet is also a subtle way to add light and style to small space. You’ll feel like you stepped back in time with this unique bathroom decor idea. The mosaic tile and stone floors recall the Roman bathhouses, which were a luxurious part of life during ancient times. The spacious shower feels more like a spa, while the large, elegant tub is ideal for a rejuvenating whirlpool bath. Although this design is shown in a large space, you don’t need a huge home to make it work. The placement of the furnishings works quite well in a small bathroom, and the simple niches are elegant ideas for storage space. This country style bathroom is another elegant home decoration idea for small spaces. The stone floor combined with the black and white tile gives a sense of brightness and openness to the room. The eggshell-shaped tub has a shower attachment and the double sink vanity provides plenty of room for your morning routine and lots of storage space. Other great design elements are the use of the blinds as a towel rack and the many niches for storage and decoration. The eggshell-shaped mirrors ties the whole bathroom together, and the shape is echoed in both the tub and the calla lilies scattered around the room. This fun, floral design is the perfect home decor choice for the little princess in your life. The soothing pastel blue of the walls combined with bright purple flowers on the curtains and zebra-striped accessories will help children complete their morning routine in a cheerful manner. The tub is also specially designed for kids. The stepping stools and handles will help your little ones get out of the tub without accidents, and the soft cushions scattered about the room make it easy for adults to assist at bath time. The canopy design and chandelier also add visual interest to bathrooms that have an outdated style. Fans of old Hollywood glamour can choose bathroom decor ideas that are an homage to their favorite stars. 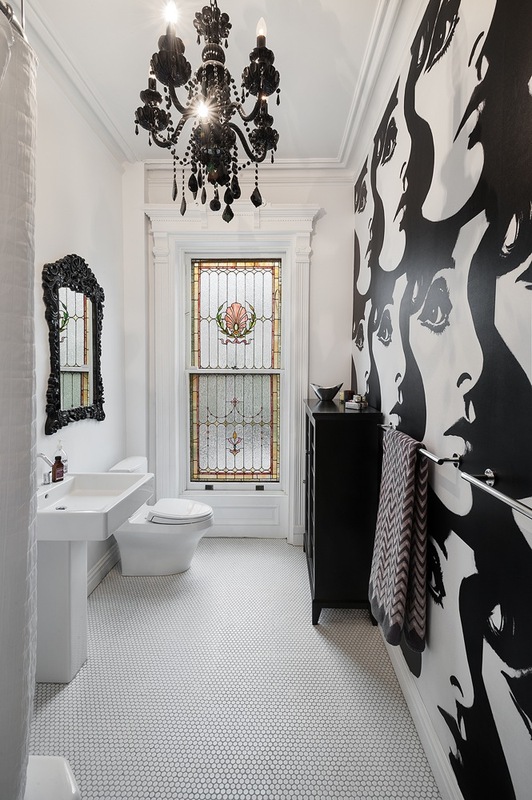 This sophisticated black-and-white bathroom is a tribute to the Audrey Hepburn film, My Fair Lady. The black-and-white design echoes the costumes in the famous Ascot scene, while the stained glass window recalls the arts and crafts movement of the Edwardian era. This design also uses the long, narrow space in a clever way. The graphic print opens up the room, while the square design of the sink and cabinets provide plenty of storage in the small space. Many urban dwellers are renovating old apartment buildings, warehouses, and even factories into modern living spaces. These bathroom ideas works within the unusual space to create a functional bathroom that combines industrial chic with modern technology. The custom built shower fits perfectly into what would otherwise be an awkward corner, and the exposed pipes are a chic design touch that also gives the illusion of more space to the room. 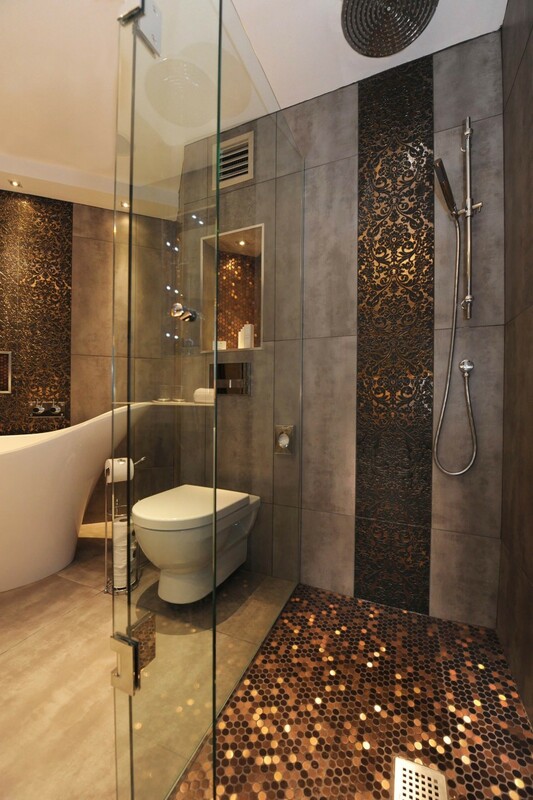 This bathroom also has plenty of modern touches with a state of the art shower head and a heated floor.